When upgrading your FJ80, FZJ80, HDJ81 or Lexus LX450 with a suspension kit it is essential for safety that you increase the length of your stock brake lines with longer brake lines. Why not give your Landcruiser a unique look and replace your brake lines with these custom 5 Layer stainless steel brake lines from Extreme Landcruiser. 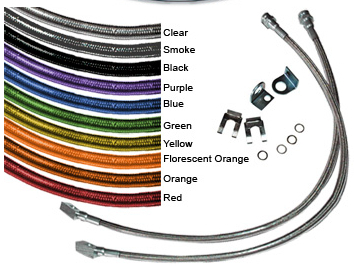 These Custom Extended Brake lines come in 10 color options and in varying lengths from 0"-2", 3", 4", and 6" Over Stock Lengths so you are sure to be able to find the option best suited to your needs. Custom lengths of any height are available at an additional cost, please inquire if you need longer. 7 Hose Set - Replaces all soft lines. These made specially to order. Allow for up to 2 weeks for delivery as these are made to order. Please let us know your suspension height over stock when ordering.